Please new holding tank and pumpout certifications required for all vessels in Rhode Island waters. Dutch Island in the center forms a protected harbor with Conanicut Island on the right. Click for a larger view. These charts are not for navigation. Dutch Harbor is a reasonably protected anchorage with good holding ground and a mooring field as well. It’s a lovely spot in the West Passage between Dutch Island and Conanicut Island which provides back door access to Jamestown less than 1 mile away . The stately homes that face the harbor offer their owners a tranquil view of the harbor and the island that protects it from the swell off Block Island Sound. The street that leads from the harbor across the island winds right down the main drag where all the restaurants and amenities are. There are several to choose from including Chop Mist Charlie’s, a premiere Rhode Island eatery. Chop Mist Charlie also has the most amazing on-the-road catering service if you are traveling with a crowd. They cook everything on portable kitchen trucks that they drive right alongside your venue. Their staff is courteous, pleasant and highly efficient; the food is very well prepared, and reasonably priced. All in all, it’s a highly recommended experience. Or you might try Trattoria Simpatico, Tricia's Tropigrille, Family Theater, the Portugese American Restaurant, or the Jamestown Oyster Bar. Simple fare is also available at the House of Pizza, East Ferry Deli, and Spinnaker's Cafe. S tonington to Dutch Harbor is 31 NM. Depths in the harbor are about 15 feet and the bottom is mostly mud. Dutch Harbor Boatyard (401-423-0630 and VHF channel 69) maintains the mooring field and has 8-10 transient moorings available. There are heads and showers at the dock but no fuel. Ice is available, as is a self-service pump out station. 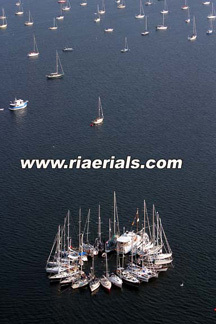 Their email address is info@DutchHarborBoatYard.com and their web site is DutchHarborBoatYard.com. They take advance reservations for transients and clubs. The transient charge is $50 per night. There is also an on site restaurant called The Shack. The best things to do in Dutch Harbor are go for a swim and watch the sunset, most likely in that order. The water is clean and clear, the vistas lovely, and the chance to relax is a prime one. Don't miss out. A sunflower raft up just beyond the mooring field at Dutch Harbor.